Following an anticipated premiere at the Edinburgh International Festival, Alan Ayckbourn’s ambitious new play The Divide comes to The Old Vic Theatre. An unflinching portrayal of repression, rebellion and forbidden love, the gripping drama is presented in two parts at the London venue, playing a limited season from February 2018. A tale that resonates in our turbulent society, The Divide takes place in a dystopian world, following the aftermath of a deadly contagion. A century from now, the infection has rendered contact between men and women fatal, and under the rules of a mysterious Preacher, an impossible solution is enforced. As genders become divided, male adult survivors are forced to wear white for purity, whilst the women are clothed in black as a sign of sin. With siblings Elihu and Soween growing up in this twisted society, they slowly begin to realise cracks in the system. When Elihu falls for Giella, the daughter of radical mothers, he risks his life by threatening to ignite a deadly rebellion. Under brutal repression and unthinkable love, can there ever truly be a solution? Casting includes Jack Davies as Elihu, Erin Doherty as Soween, Clare Burt as Hork, Thusitha Jayasundera as Kest, Richard Katz as Conrad, Joanne McGuiness as Axi, Sophie Melville as Sassa, Clare Lawrence Moody as Desollia, Weruche Opia as Giella, Martin Quinn as Fergo, Letty Thomas as Grosh, Sian Thomas as Older Soween and Finty Williams as Chayza. Associate Director of The Old Vic Annabel Bolton directs, with previous credits including Future Conditional and Charlie and the Chocolate Factory. Further creative team members include designer Laura Hopkins, lighting designer Bobby Aitken, sound designer Ash J Woodward and video designer Lucy Hind, alongside composer David Plater and movement director Jessica Ronane CDG. 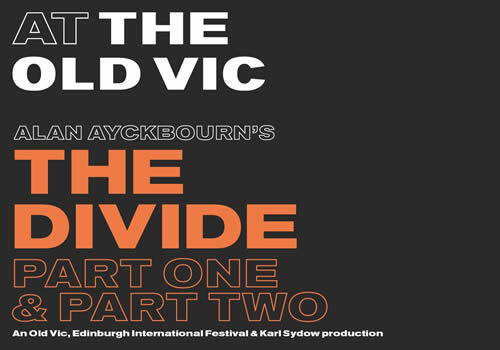 From the writer behind domestic comedies including Bedroom Farce and How the Other Half Loves, The Divide is Ayckbourn’s new play that runs in two parts at The Old Vic from February 2nd to 10th 2018. The Divide is not suitable for children.